Despite growing protests from Native American groups and environmental activists, construction of the controversial Dakota Access oil pipeline is likely past the point of no return, some experts say, while others said that to find a solution to the tense standoff, both sides may need to compromise a little. Interested in Dakota Access Pipeline? Add Dakota Access Pipeline as an interest to stay up to date on the latest Dakota Access Pipeline news, video, and analysis from ABC News. "You have seen this kind of slow train wreck coming for a long time. One would think that the option that would save face for all the parties would be to reroute the pipeline," Tyler Priest, a professor at the University of Iowa who served as a senior policy analyst for the President's National Commission on the BP Deepwater Horizon Oil Spill and Offshore Drilling, told ABC News. However, rerouting the pipeline at this stage would incur massive costs and logistical obstacles, such as acquiring new land, permits and organizing construction during the winter months, he noted. The protest near Cannon Ball, North Dakota, has gained momentum in recent weeks, with thousands of protesters camped out at the location, fueled by donations pouring in from across the country. A crowdfunding website for the protesters recently reached $1 million in donations. "For Dakota Access, time is money," Priest said. "They want to get this done as fast as they can." "Most of it is already built, so I don't know if it would require pulling up pipeline," he said of a potential reroute. "If you had to arrange emergency easements at this point in time, it would cost the pipeline company a lot more." "The pipeline company and the main advocates for it argue that no laws have been broken and this is following all regulations and laws and permitting at the state and federal level. But clearly there is an impasse with much larger political implications," Priest added. "In situations like this, two sides have to come to the table and broker some kind of compromise." Experts say there is no perfect way to transport oil, especially the volatile light crude oil from the Bakken Formation, an area that spans parts of Canada and the northern U.S., including North Dakota. But in general, pipelines are preferable to rail transport because they are cheaper and more efficient, according to Priest. "If they run the pipeline through [the contested territory], this is going to have very serious political fallout with our government's relationship with Native Americans. But they can't just hold up this permit forever," he said. "The logical solution would be that they would reroute the pipeline so that the pipeline gets built and it is not crossing lands that the Standing Rock Sioux tribe is opposed to." Tribal Chairman David Archambault II commented publicly for the first time this weekend that the Standing Rock Sioux tribe was willing to compromise, telling reporters that the pipeline "doesn't have to put our water at risk" and "everybody can still benefit," according to The Associated Press. A representative for Energy Transfer Partners, the parent company of Dakota Access, did not immediately respond to ABC News' request for comment today. But the Texas-based company previously stated its desire to start operating the pipeline as soon as possible. The U.S. Army Corps of Engineers is currently reviewing the final easement needed by Dakota Access before it can construct the pipeline under Lake Oahe, which is upstream from the Standing Rock Sioux tribe reservation. A federal judge this summer denied the tribe's request for an injunction to halt construction of the pipeline, but three federal government agencies (the Department of Justice, Department of the Army and Department of the Interior) intervened in an unprecedented manner, requesting in a joint statement that the "pipeline company voluntarily pause all construction activity within 20 miles east or west of Lake Oahe." 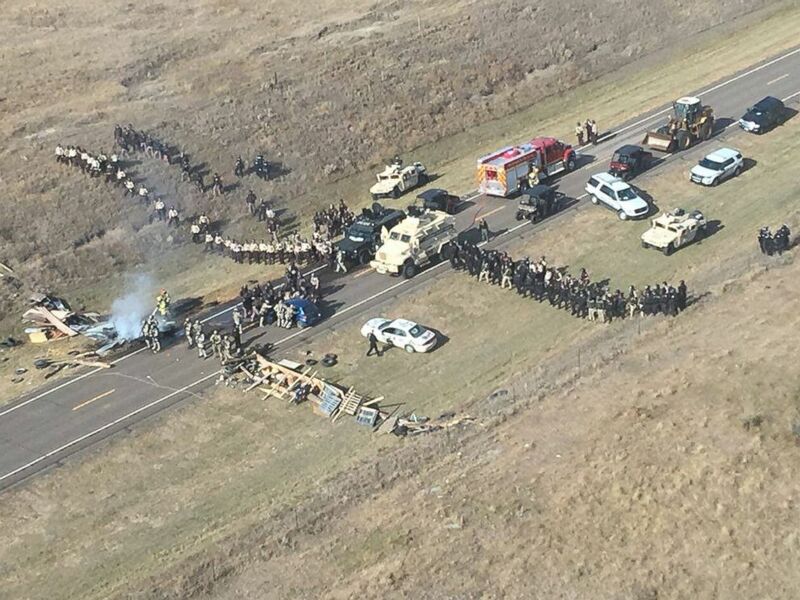 Protesters against the Dakota Access Pipeline stand-off with police in this aerial photo of Highway 1806 and County Road 134 near the town of Cannon Ball, North Dakota, Oct. 27, 2016. Afolabi Ogunnaike, a senior analyst at the energy consulting firm Wood Mackenzie who specializes in North America's crude oil markets, told ABC News, "it is possible to have some rerouting. However, oftentimes when these pipeline companies are approving a route, there are other constraints to consider such as the geography." "For Dakota Access, we know construction has continued on much of the rest of the length of the pipeline. It is approaching 90 percent complete in most of the states. So really it is this 20-mile stretch that is part of this over 1,000-mile pipeline," Ogunnaike said of the part of the pipeline that was being protested. "One would imagine that a reroute is possible, but I don't know how well that would be received," Ogunnaike added. "If, for whatever reason, in the extreme case in which something happens and this pipeline is unable to go forward, then the alternative is the use of crude by rail. It's more costly, and government studies have shown that crude by rail has a higher incidence of accidents and leaks than pipelines do," Ogunnaike said. Many critics, including prominent activist Rev. Jesse Jackson, have pointed out that the pipeline's current path is actually a re-route of a previous plan. According to the Bismarck Tribune, the original path of the pipeline was slated to cross the Missouri River just north of Bismarck, but many complained that it could contaminate the city's water supply. Thus the path of the pipeline was moved to cross the river just north of the Standing Rock Sioux tribe's reservation.